Hello! 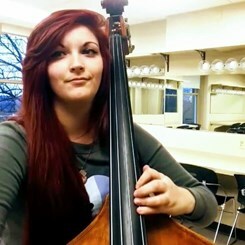 I'm a current music education student at Western Kentucky University studying double bass. I'm involved with marching band, pep band, symphonic band, wind ensemble, and symphonic orchestra. I'm involved in WKU's collegiate ASTA organization and also the vice president of WKU's NAfME collegiate organization. I have studied under Wes Jones, Patrick O'Rourke, and Rafael Velez. I founded the St. Paul School Orchestra Program in 2016 were I taught beginning violin and cello. I've given private lessons to violins, cellos, and double basses starting from ages 6 to 17. If you want to learn an instrument today request a lesson with me! Request Lessons with Holly Sims today!